...and I'm pretty sure that you are standing on the highway overpass. Nice photo perch. Yes, indeed, and I got a good face full of diesel smoke as those locomotives went under me. 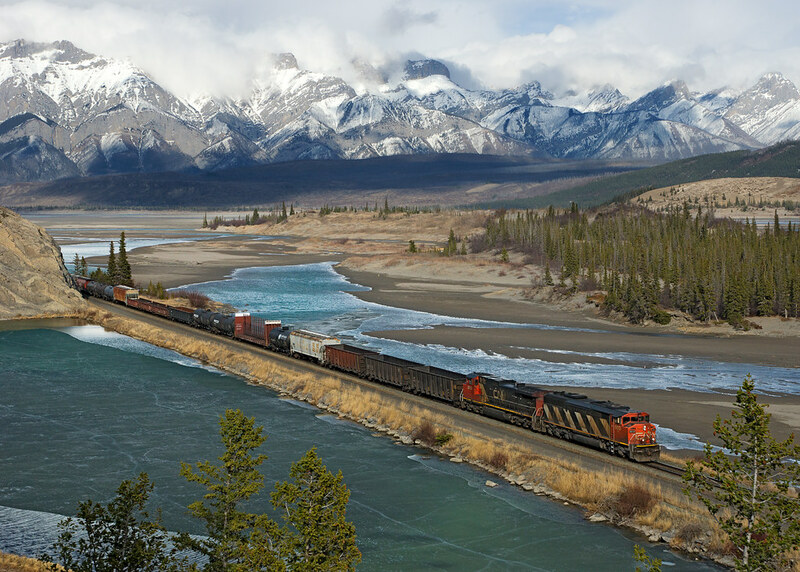 Here is the same west bound coal train as seen in the photo above, this time running along the Moose Lake shoreline near the west end at Red Pass Junction. Red Pass Junction was for many decades the place where CN BC North trains diverged from the mainline and onto the Tete Jaune Sub heading for McBride, Prince George & onto Prince Rupert. About 25 years ago CN built exchange tracks in & around the Tete Jaune Cache & Valemount area that turned the old mainline Albreda Sub and the parallel Tete Jaune Sub (renamed the Robson Sub) into a sort of double track system whereby most westbound trains to Vancouver & Rupert follow the old Tete Jaune Sub while east bound trains from Vancouver & Rupert are routed via the Albreda Sub. Over one section of track it is common for an east bound train from Prince George to follow a westbound train for Vancouver on the same bit of track moving in the same direction. See: www.okthepk.ca/mobile/mapRobsn.htm. BTW, the Tete Jaune Sub still exists, but it is shorter today, connecting Tete Jaune Cache to McBride where the Fraser Sub to Prince George starts. 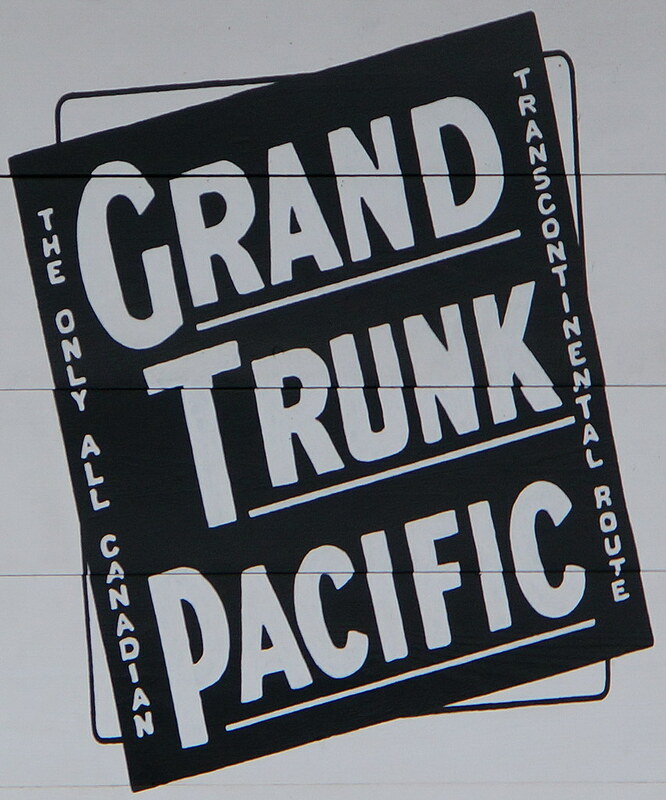 The Robson, Tete Jaune & Fraser Subs mostly originate from trackage constructed c1912 by the Grand Trunk Pacific. The Albreda Sub was mostly constructed around about the same time by the Canadian Northern. Between Jasper & Red Pass the Albreda Sub is mostly sitting on the original GTP grade, but in at least one section (just east of Yellowhead Pass) it sits on the old Canadian Northern roadbed. All somewhat complicated and related to two parallel competing railways being constructed through the same route at about the same time & both ending up bankrupt not long after they were completed. Thank you for that. I had been wondering about that junction area around Tete Jaune Cache. 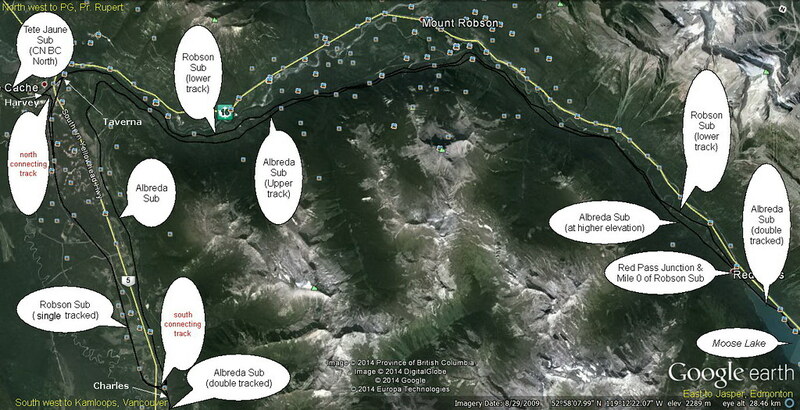 1 - The Albreda Sub runs from Jasper, Alberta, to Blue River, BC. Much of the Albreda Sub is double tracked. The Albreda Sub from Red Pass to Blue River was constructed 100 years ago by the Canadian Northern Pacific. 2 - The Robson Sub runs between Red Pass Junction & Charles. It is single tracked, as is the Albreda Sub, between those two points. The Robson sub between Red Pass & Taverna was formerly part of the Tete Jaune Sub and was built 100 years ago by the Grand Trunk Pacific (GTP). Between Taverna & Charles, The Robson Sub is 'new' track constructed by CN in the early 1980's. 3 - The North & South "Connecting" tracks were built in the early 1980's as part of the 'Robson Sub project'. 4 - The Tete Jaune Sub today runs between Taverna & McBride. Before the early 1980's it began at Red Pass Junction. It was built 100 years ago by the GTP. 5 - West bound trains from Jasper to Kamloops are normally routed over the Robson Sub between Red Pass & Charles. 6 - West bound trains from Jasper to Prince George are normally routed over the Robson Sub as far as Taverna, & then onto the Tete Jaune Sub west to McBride. 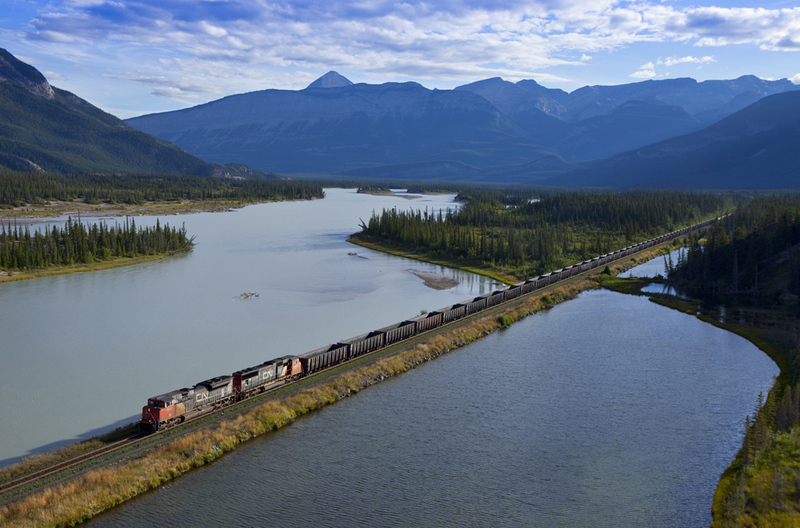 7 - East bound trains from Kamloops to Jasper are routed over the Albreda Sub all the way. They normally do not go onto the Robson Sub. 8 - East bound trains from Prince George to Jasper can get interesting in that they very often become west bound trains for a short distance. Typically they travel over the Tete Jaune Sub as far as Harvey, & then go onto the 'North Connecting Track', and then onto the Robson Sub heading 'west'. They then are routed onto the 'South Connecting Track' & then onto the Albreda Sub heading east to Jasper. Sometimes, if there are few if any opposing train movements, east bound trains from Prince George will use the more direct Robson Sub between Taverna & Red Pass. 9 - West bound train movements on the Albreda Sub are possible, as are east bound movements on the Robson Sub. Track maintenance, outages, etc., can make such necessary. 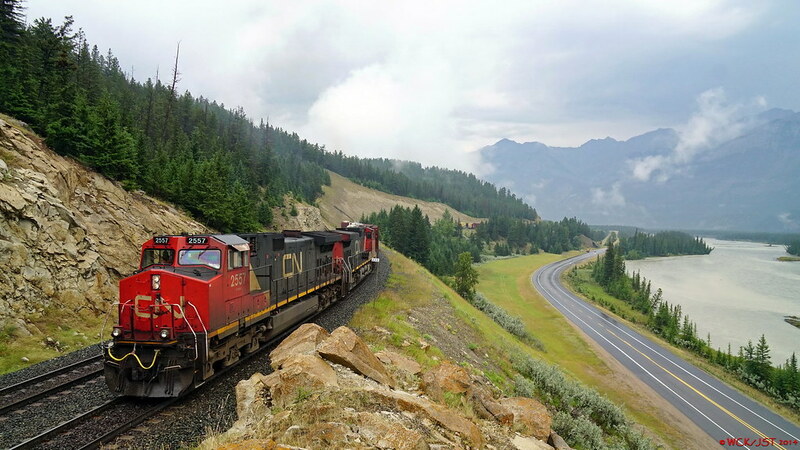 10 - Unlike Canadian Pacific's parallel trackage at various points on their route across the mountains of BC & Alberta, steep grades are not a factor in determining which route trains travel over. 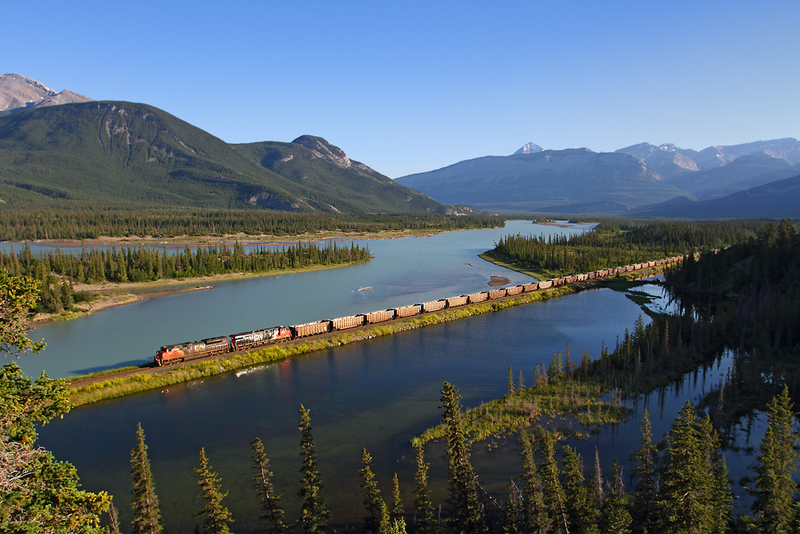 All of CN's mainline trackage through BC & Alberta is blessed with easy grades of 1 percent, or less. This includes all of the Robson & Albreda subs, and BC North (former GTP) route too. Easy grades are the reason that CN mainline trains are typically handled by just two locomotives as compared to three or more on CP. 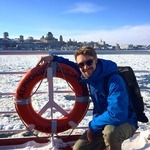 11 - There are no intermediate connections between the Robson & Albreda subs. This is due to the elevation difference between the two routes. This limits the flexibility that is normal with most double track main lines. 12 - Via's Canadian & Skeena trains use these tracks, as do Rocky Mountaineer Rail Tours trains (2 routes: CN mainline & via the ex-BCR to Whistler, BC). The passenger trains follow the same routing norms as for the freight. 13 - Both the Robson & Albreda subs continue to feature a few passing sidings. They see little use and are not long enough to accommodate the very long freight trains that are becoming the 'norm' nowadays. It was 100 years ago today that the Grand Trunk Pacific Railway's (GTP) last spike was driven near Fort Fraser, BC. 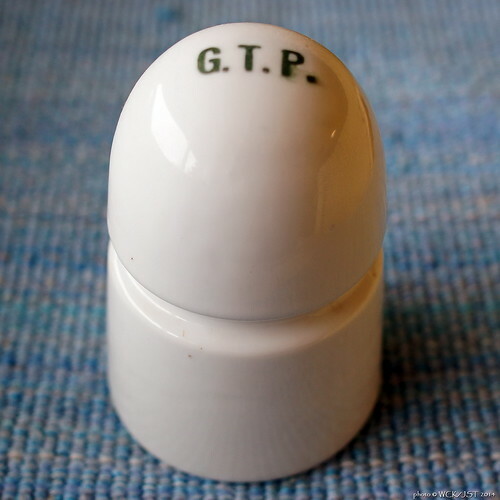 GTP 'insulator' - an artifact of the original Grand Trunk Pacific Railway that connected Winnipeg with Prince Rupert. 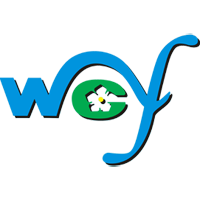 I am wondering if the younger members of the WCFF have any idea what this item was used for? 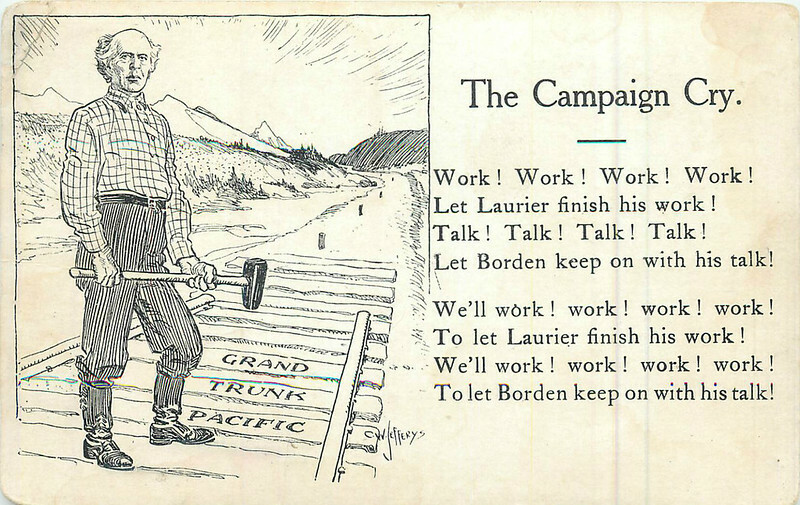 Laurier, for those of you who don't know, is the guy whose image is featured on the Canadian $5 note. Borden, is on the $100 note. CN # 's 2557 & 2671 lead west bound mixed freight just east of Jasper, Alberta at mile 233 of the Edson Subdivision - 16 July 2014. That is the Trans-Canada Highway # 16 (Yellowhead Route) & Athabasca River on the right of photo. I am fairly sure that the highway sits on the abandoned grade of the Canadian Northern Railway. The present CN grade (originally single-tracked) was constructed just over a hundred years ago by the Grand Trunk Pacific Railway. 1) Prince George Rail Museum - this is the museum that possesses the restored BC Rail electric locomotive that operated to the Quintette mine in Tumbler Ridge, among other pieces of historic and restored BCOL equipment. I look forward to visiting them in the next couple weeks. 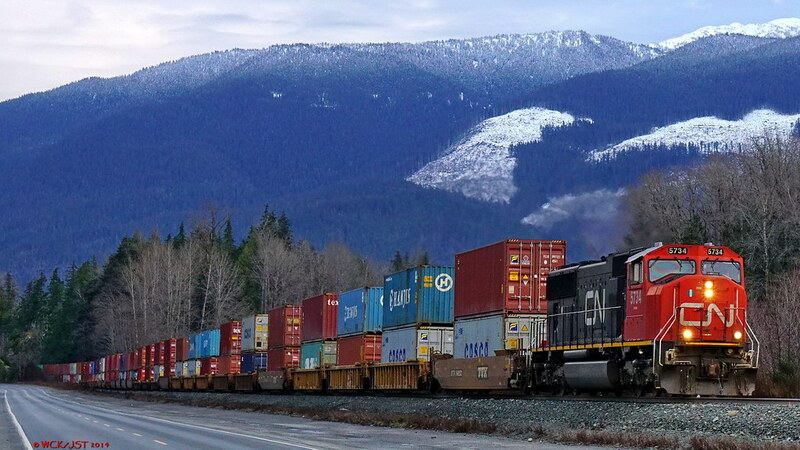 2) VIA Rail's Skeena - although this isn't a big deal for those who live in Vancouver with the Canadian, Amtrak Cascades, and the WCE, but it does provide a nice mix, in with the heavy amount of freight traffic that goes through here. 3) CN's presence in the community - from banners lining Highway 97 to the CN Center, it seems that Canadian National's presence in this city is only rivaled by forest products company Canfor, who have sponsored everything from UNBC's main lecture hall, to the aquatic center. 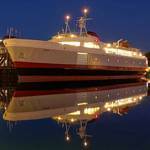 I am looking forward to sharing my rail-side experiences here. 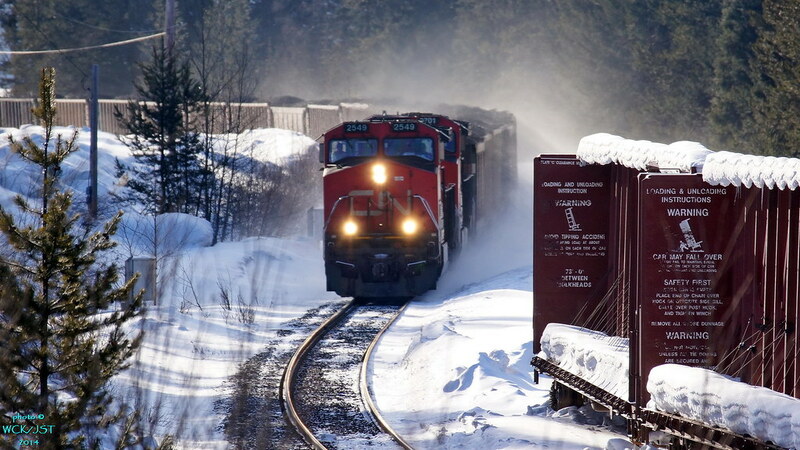 CN Westbound container train, seen near Snaring River, east of Jasper AB. - evening of September 8, 2014. 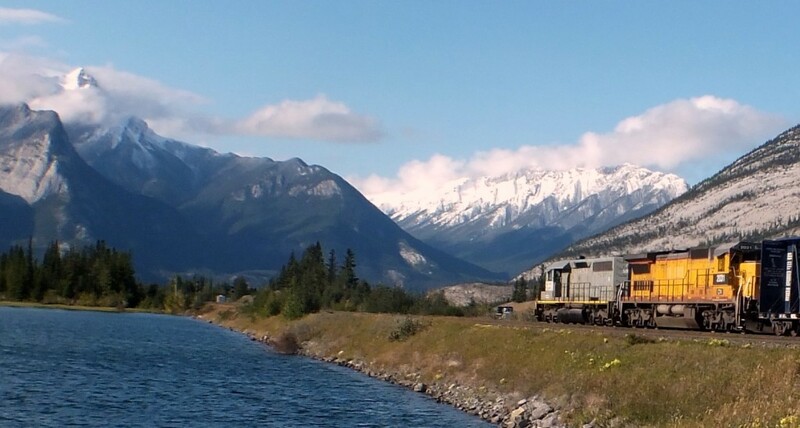 Copied over from the thread "Canadian Pacific from Kamloops Eastward"
The straightaway near Snaring River &amp; the Jasper airfield is pretty good, with a mountain backdrop and a nice pond (see a photo in the VIA thread that I posted, a few weeks ago). I think that some of the most photogenic locations on CN's route through the Rockies are well to the north east of Jasper and accessible only from a rough gravel road known as the Celestine Lake Road. I believe it is only open through the summer months. I have not been there but have noted it as a 'must check out soon place'. It is the place where that superb railway photographer Jonathan Lewis (from the UK) goes to get many of his fine CN photographs when he is over in North America which seems to be every year in September. Have a look at this & this. See his website at www.milepost39.co.uk/mp39.asp?do=home. Here are a few more links to that photogenic Devona-Snaring area along CN's mainline east of Jasper. I want to go there 'right now' & check it out. 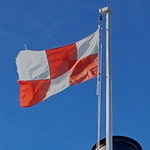 I just did some checking of the area with Google Maps and Google Earth. I think this place is also is accessed via the Celestine Lake Road. 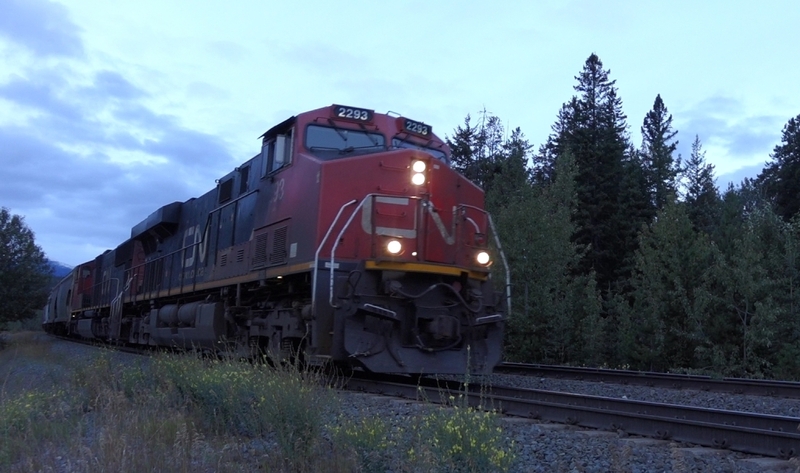 A video of a couple of CN trains passing by me at Barriere, BC. I'm trackside at a level crossing. Both trains are heading eastwards. The 2nd train in the video is of empty coal cars. This is puzzling to me, because presumably they are coming from Lower Mainland, and I thought that only CPR handled coal cars to Roberts Bank. 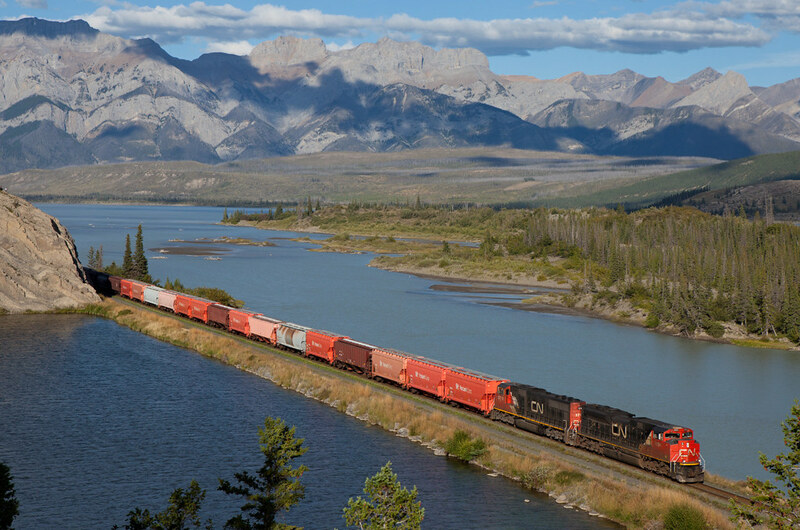 CN brings down coal from two mining areas just east of Jasper National Park. The mine at Obed ships most of their coal through Roberts Bank. The other mine and some of Obed's go through Prince Rupert. Down at Roberts Bank you can also spot some Burlington Northern coal trains that have come up from Washington State. Here's my video of an eastbound CN freight train passing through Valemount BC. This is from September 8, 2014, and I filmed this while we were waiting for the VIA Canadian to pass by. 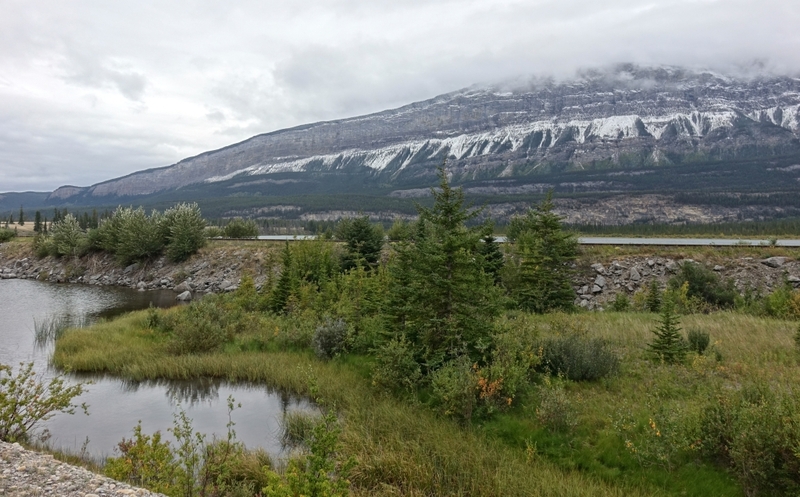 This was day-2 of our holiday trip, and here at Valemount is where we noticed a dramatic change of the weather, as we were about to experience an unseasonal cold-snap for the Robson-Jasper area. ....so when you see my cameo in the video, of me wearing a few layers of clothes, that's why. Here's my video of an eastbound CN freight train passing through Valemount BC. That train looks to be headed to Prince George, though I am less than certain about that. I think I spotted Pinnacle Pellet hopper cars. They are the company that is big in wood pellets, such as are burned in high-tech pellet wood stoves. They have a brand-new export facility in Prince Rupert. 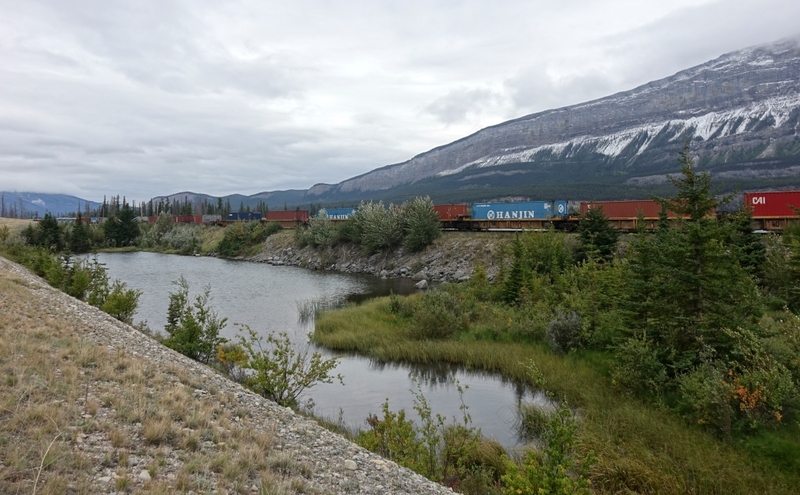 Eastbound CN potash train, approaching Jasper townsite from the west. I am trackside, next to the west road entrance to Jasper town. - morning of September 10, 2014. I start out on the south side of the double track. I'm there, waiting for the westbound Rocky Mountaineer to leave Jasper. But when the potash train slows and stops, I realize that it will totally block my view of the Rocky Mountaineer train on the other track. So I walk back to the road, go through the underpass, and walk back down the other side of the track area on the north side. I'm glad that underpass was close to me. Here's a still pulled from the video file, of the head-end passing me. That train would have had to stop to take on a fresh crew in Jasper, the Division Point between CN's Albreda & Edson subdivisions. It was fortunate that you were able to access that underpass to get onto the other side of the tracks. Otherwise trying to cross slow moving or stopped trains is not a good idea & could be a life-shortening move! That would of course be an empty potash train, returning to Saskatchewan for another load. From the video I gather the train was a long one. CP moves such long, loaded ones with four locomotives, two at the head end, one just back of the mid point of the train, and one at the tail end. 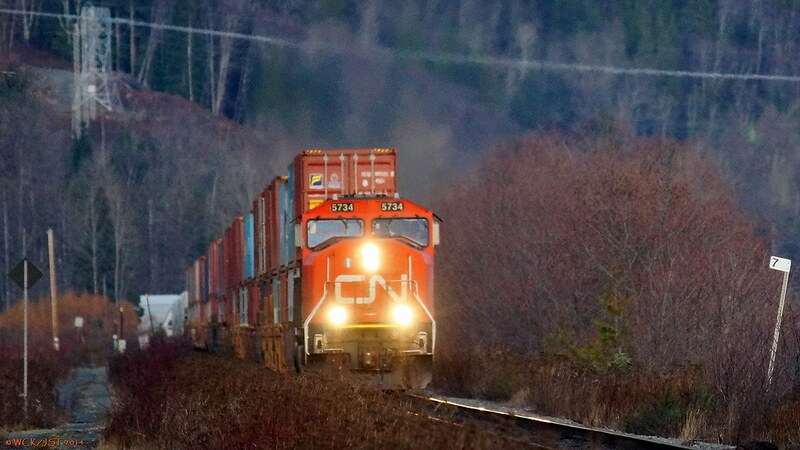 CN is blessed with much easier grades and needs less power to move the same size/weight of train. This translates into less cost to move a train over a similar distance on CN versus CP. CN is blessed with much easier grades and needs less power to move the same size/weight of train. This translates into less cost to move a train over a similar distance on CN versus CP. 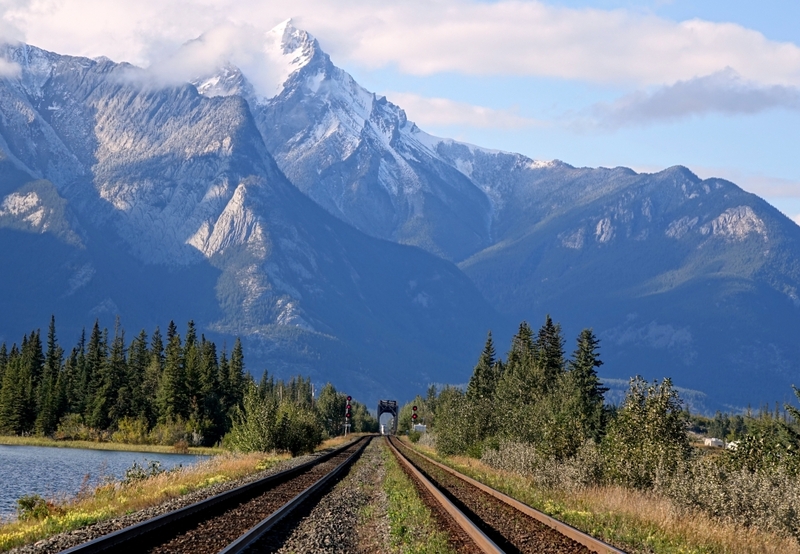 Sandford Fleming was correct in the Yellowhead Pass being the best rail route through the Rockies, which also would have eliminated the Selkirks problem. Too bad for CPR, but there were lots of "Build in the South" pressures of the day which compelled CPR to choose the tougher route. Same story in BC's Boundary region, where various CPR operated lines were built "all in Canada" and as a result were very difficult to build and to maintain/operate. It would have been far easier to build a gentle-grade railway that followed the meandering river valleys that crossed back and forth across the Canada-USA border many times. 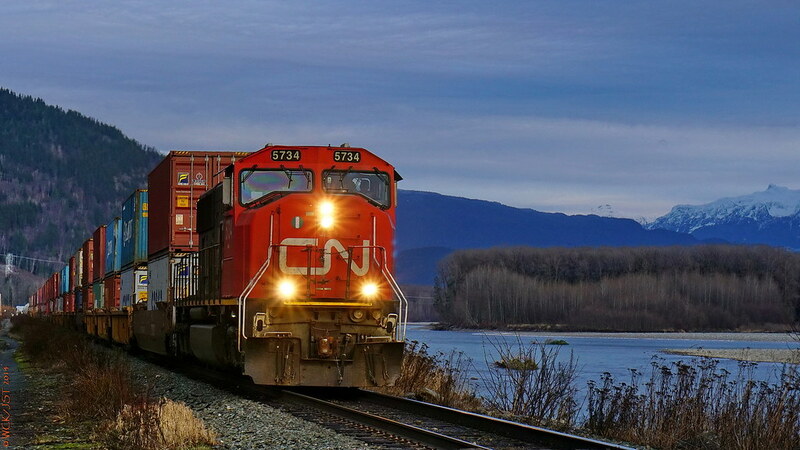 CN locomotive #5734 leads west bound container/grain train over the Skeena subdivision (BC North Main) @ MP 7 near New Remo, about 12 km west of Terrace, BC - 15 December 2014. This was a train of normal length handled by just one locomotive. In the background of the first photo you can see a BC Hydro high voltage powerline. There is actually two lines there, one of them being the new 'North-West Transmission Line' built over the last couple of years that feeds power north toward Dease Lake, BC. This shot was taken about 25 km west of Terrace. That is Highway 16 (the Trans-Canada Yellowhead Route) on the left. I enjoy the colouring and lighting in this photo. Westbound double-stack near Snaring River, seen roadside in Jasper National Park on a snowy cold mid-September day.